29 Dufferin is one of the TTC’s target routes for improved performance, and it also happens to be a route that I have been following with TTC vehicle tracking data from selected months going back to November 2011. This article reviews the line’s operation on weekdays. This article is somewhat technical, but has been written for a general audience to the degree the subject allows. An important factor in reviewing service on the street is the schedule itself: the headways (time between vehicles) and the running times provided for each trip. Headways may look good on paper, but if service arrives unreliably, or if some of it never reaches the destination thanks to short turns, then the advertised service is a polite fiction. Running times also have an effect, especially if they are shorter than the typical time required to drive from one end of a route to the other. When an operator cannot make the scheduled trip, the bus runs late and is quite likely to short turn simply to get it back on time. In theory, this “restores” normal service, but if vehicles are chronically late, the process never ends. The “treatment” never cures the “patient”. This spreadsheet shows the scheduled headways and trip times for all of the periods covered by this article. In a few cases, there are two schedules shown for the same month because a change was implemented part way through. The Dufferin Bus operates primarily between Dufferin Loop (at the Western Gate of the CNE ground) to Wilson Station. During peak periods there is a short turn at Tycos Drive where half of the service returns south. During certain periods (with seasonal variations), half of the service runs through the CNE grounds to the Princes’ Gate (eastern entrance). In September 2013, the bridge on Dufferin at the rail corridor north of the CNE closed on very short notice for repairs. Service that was scheduled to operate to the Princes’ Gates turned back at Dufferin Loop. This resulted in half of the buses having more running time for their trips between Dufferin Loop and Wilson Station. Concurrently, a diversion for water main construction was operated southbound between College and Queen. These two offset each other, at least for the buses that were scheduled to run through to the Princes’ Gate. Extra running time (up to 10 minutes) was not added to the schedules until the end of March 2014 in anticipation of the re-opening of the Dufferin Street bridge. In November 2014, the route officially switched to articulated bus operation Weekdays and Saturdays, although these vehicles had been present for some time before. In April 2014, there was a major restructuring of the schedules: considerably more running time was provided to reflect actual conditions, and the split operation at the south end of the route was discontinued on weekends. A New Way To Measure Service Quality? 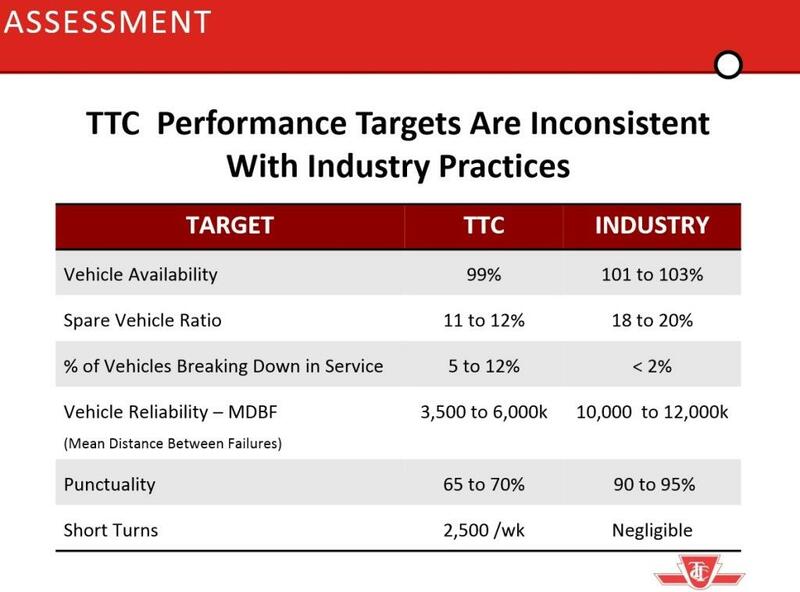 At its recent Board Meeting, the TTC received a presentation [scroll to p. 3] from Chief Service Officer Richard Leary on plans to update management and measurement of surface route service quality. The monthly CEO’s report includes a number of “Key Performance Indicators” (KPIs) intended to track various aspects of the transit system. However, the methodology behind some of the KPIs, notably those related to service quality, leaves a lot to be desired. Moreover, information that could track basic issues such as vehicle reliability is not included. This begs the question of whether the indicators exist more as a security blanket (“we have KPIs therefore we are good managers”) than as meaningful management tools, not to mention as reports to the politicians and public. The TTC aims to have almost enough vehicles available for service relative to actual needs, and operates with a lower spare ratio than the industry overall. This has two effects. When unusual demands for service arise, there is no cushion to roll out extras. Vehicles are not maintained often enough to prevent in service breakdowns. This shows up in a mean distance between failures that is very much lower than the industry average. The situation is actually compounded by an internal measure of service delivery: a garage counts a bus as “entering service” if it makes it across the property line onto the street. Whether the bus runs for an entire day or breaks down a block from the garage, it counts toward service provided. This is complete nonsense, but shows how the construction of a metric can induce behaviour that is counterproductive. Actually keeping the bus in the garage could allow it to be repaired and improve reliability, but that’s not what the garage is measured for. Moving to a higher spare ratio and more frequent routine maintenance on vehicles is expected to yield better service with fewer in service breakdowns. Late in 2014, the TTC began this shift by slightly increasing spare ratios at each garage, and the MDBF for the bus fleet has risen to 7,000km. This will have to be tracked over a longer time, however, to ensure that the improvement is permanent and can be linked to further increases in spares and maintenance work. This has a non-trivial cost for the TTC. With a total scheduled service of about 1,500 buses, a 6% increase in spares represents 90 vehicles, or a substantial portion of a typical yearly bus purchase, not to mention a fair amount of garage space. Service changes to be implemented on June 22 include a large number of seasonal cutbacks in service on a par with what was done in 2013. There is an unusually large amount of construction underway around the city and this is reflected both in adjusted schedules and in a much higher than budgeted number of hours for construction-related service. This activity is one of the constraints on service growth for 2014. Updated June 18, 2014: With the reopening of Cherry Street south of Mill Street, the 172 Cherry bus will resume its normal routing through the Distillery District (via Parliament, Mill and Cherry) on Saturday, June 21. 29 Dufferin will be formally scheduled as an articulated bus route on weekdays. Although there will be fewer vehicles than at present, the reduction is smaller than the relative size of the vehicles giving an increase in route capacity. This may be offset by service reliability as happened already on 7 Bathurst. The Queen and King streetcar routes will divert around track construction at Broadview & Queen from June 30 to July 25. 501 Queen cars which are now diverting both ways via Broadview, Gerrard and Coxwell will alter their route to divert via Parliament, Gerrard and Coxwell. 504 King cars now diverting both ways around the Don Bridge constuction via Parliament and Queen will alter their route to divert via Parliament and Dundas. 501/502 bus replacement service on Queen will divert both ways via Pape, Dundas and River. As with the diversion service already in operation for the Queen & Leslie track work, these buses will loop downtown via Church, Richmond and Victoria. There will be no 503 Kingston Road Tripper service to York & Wellington. On March 30, 2014, the TTC will make changes to many routes. In the detailed listing linked below, these are broken into four groups for miscellaneous service changes, new construction projects, route restructurings, and seasonal changes. The 29 Dufferin and 329 Dufferin Night routes will divert southbound via College, Lansdowne and Queen around water main work on Dufferin. The interlined operation with 316 Ossington will be discontinued until late 2014 when this diversion is scheduled to end. Reconstruction of the Gardiner Expressway will split the 501 Queen, 301 Queen Night, and 508 Lake Shore routes at Humber Loop. The schedule will be the same one used in fall 2013 during construction on Lake Shore. This is planned to last only for one schedule period (to mid May). The intersection of King & Sumach will be rebuilt to add special work leading to new tracks on Cherry Street. Streetcar service here is already diverting around the closed bridge east of River and so the construction has no effect on service. This route is already notorious for erratic service which will likely become even worse with fewer buses. I plan to compare vehicle tracking data for this route for the “before” and “after” operations in a future article. Several routes have new and/or adjusted last trip times to meet last subway trains including an allowance for the time it takes riders to get from the subway platform to the bus. 322 Coxwell and 324 Victoria Park Night Buses will operate directly through Bingham Loop. Eastbound 322 Coxwell buses will enter the loop at the west end via Bingham and exit directly onto Victoria Park as 324s. Southbound 324 Victoria Park buses will enter the loop on the streetcar platform from Victoria Park and exit via Bingham to Kingston Road as 322s. Service on 36 Finch West will be reorganized by removal of the scheduled short turns at Kipling (36A) and Jane (36C), and increase of service on the renamed 36 Humberwood (formerly 36B). The express service on 35 Jane will be split off as 195 Jane Rocket and it will operate independently of the schedule for the local service. Because the 195 will run during periods that the 35E does not today, the headways at local stops will widen considerably during many periods. The 52 Lawrence West and 58 Malton routes will be combined as route 52, and the 58 Malton route number and name will be discontinued. More service will run east between Lawrence West and Lawrence Stations as a result. Service on the 52C Culford branch of Lawrence West will be provided at all times by 59 Maple Leaf. Service in the 52G branch to Martin Grove will continue to run via The Westway over the existing Lawrence 52 route. The 79 Scarlett Road bus will now have split operation via St. Clair during midday service all days, and during the early evening on weekdays. This extends a practice already used during the peak period. The February 2014 schedules bring only minor changes on the system. A new “walking transfer” will be added between services in the south end of Liberty Village and Exhibition Loop. This will link 63 Ossington at Atlantic and Liberty Streets to the 511 Bathurst, 509 Harbourfront and 29 Dufferin routes at Exhibition Loop. Walking transfers are a quaint part of the TTC’s fare system where connections are permitted between routes that do not actually meet, but which operate nearby. This practice (and the rules governing where it is allowed) will not be needed as an exception within the overall system if the TTC moves to time-based fares. A temporary Dufferin Street bridge will allow 29 Dufferin service to resume its operation into the park. Service will be the same as in March 2013. These changes are at York Region’s request. The last afternoon peak trip of the 17A Birchmount route north of Steeles will be eliminated. This trip now leaves Steeles northbound at 6:53, and returns from Royal Crest southbound at 7:06. The last late Sunday evening trip of the 102 Markham Road route north of McNicoll will be eliminated. This trip now leaves Nashdene & Markham at 11:14 pm and returns from Mount Joy GO Station at 11:42 pm. An earlier trip will be added to 105B Dufferin North from Major Mackenzie on weekday mornings. This trip will depart southbound at 6:29 am. 300 Bloor Danforth and 307 Eglinton West will change to use the same sequence of serving terminals as the daytime 192 Airport Rocket and 58 Malton routes. There will be no change in service levels, but scheduled times at stops will be altered by the new routing. 142 Downtown Avenue Road Express was changed in late December by the elimination of a trial extension of its downtown loop west to Peter Street. This is now formally implemented in the scheduled route. Service on 509 Harbourfront will be reduced in response to lower riding, and schedules will be changed to “improve reliability” with additional recovery time. Service on some routes will be modified by adjustment of running and recovery times to improve reliability. Service levels are not affected, but some trip times will change. 41 Keele will be modified in the evening on weekdays. 30 Lambton will be modified during many periods, and recovery time will be shifted to Kipling Station to reduce bus idling at High Park Station. 73 Royal York will be modified during peak periods. Service to the Zoo on 86 Scarborough and 85 Sheppard East will be modified to reflect the change in closing time to 6:00 pm effective March 1, 2014. Last trips will leave the Zoo at about 7:00 pm. Service on 91 Woodbine will be changed on weekends to improve reliability with headways on both the 91C York Mills and 91A Parkview Hills branches changing from 20 to 24 minutes to provide extra running time.